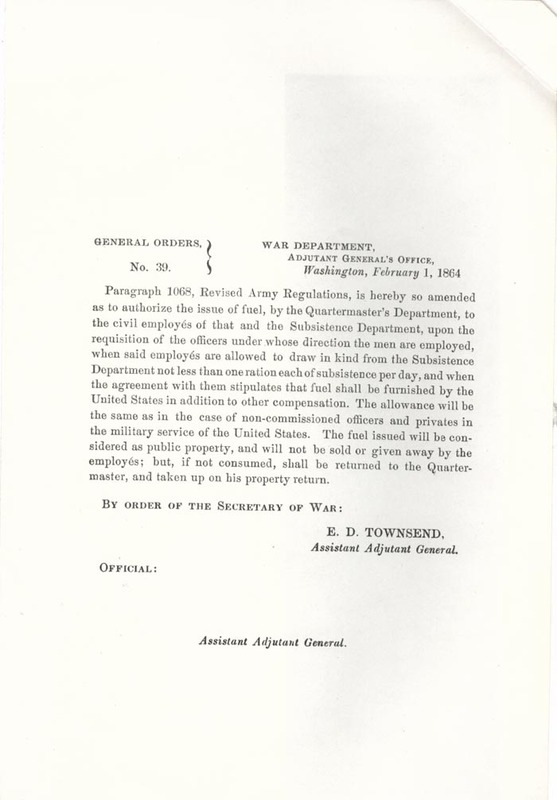 Paragraph 1068, Revised Army Regulations, is hereby so amended as to authorize the issue of fuel, by the Quartermaster's Department, to the civil employes of that and the Subsistence Department, upon the requisition of the officers under whose direction the men are employed, when said employes are allowed to draw in kind from the Subsistence Department not less than one ration each of subsistence per day, and when the agreement with them stipulates that fuel shall be furnished by the United States in addition to other compensation. The allowance will be the same as in the case of non-commissioned officers and privates in the military service of the United States. The fuel issued will be considered as public property, and will not be sold or given away by the employes; but, if not consumed, shall be returned to the Quartermaster, and taken up on his property return. Adjutant General's Office, Washington, February 1, 1864.